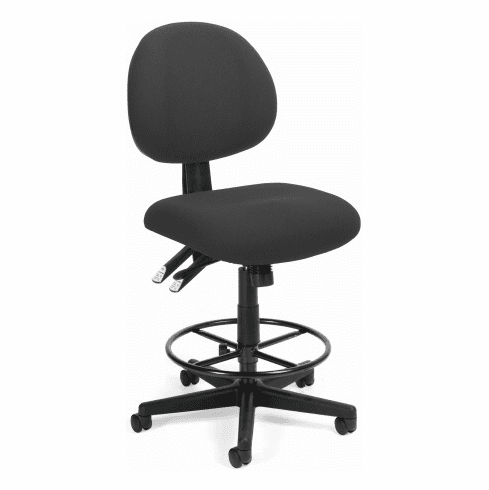 This multi-shift drafting stool can handle continuous sitting 24 hours a day, 7 days a week. Great for offices that require around-the-clock staffing, like health care, government or dispatch centers. Other features include thick, foam filled and contoured seat and backrest cushions upholstered in stain resistant fabric, one touch synchronized seat/back adjustment, pneumatic seat height adjustment, 360-degree swivel, adjustable height footring and a heavy duty five star nylon base with dual wheel carpet casters. Optional height adjustable arms available for a minimal charge. This comfortable drafting stool includes a separate extension to gain an additional 4" of height. 250 lb. weight capacity. This drafting office chair meets or exceeds ANSI/BIFMA safety standards. Dimensions: Seat Size: 20"W x 20"D. Back Size: 19"W x 17"H. Seat Height Adjustment: 23" - 27"H. Overall: 40" - 44"H x 20"W x 24"D. Weight: 42 lbs. Limited lifetime warranty from OFM. This 24 hour drafting stool normally ships in 1-2 business days.